One of the questions my co-cataloguer on the Levy Project, Pam Abernathy, and I pose as we work our way through the collection of letters and manuscripts in the Morgan’s holdings is: how was it made? In most cases, it’s not complicated: the letter was written by hand, by the person who was responsible for its content. 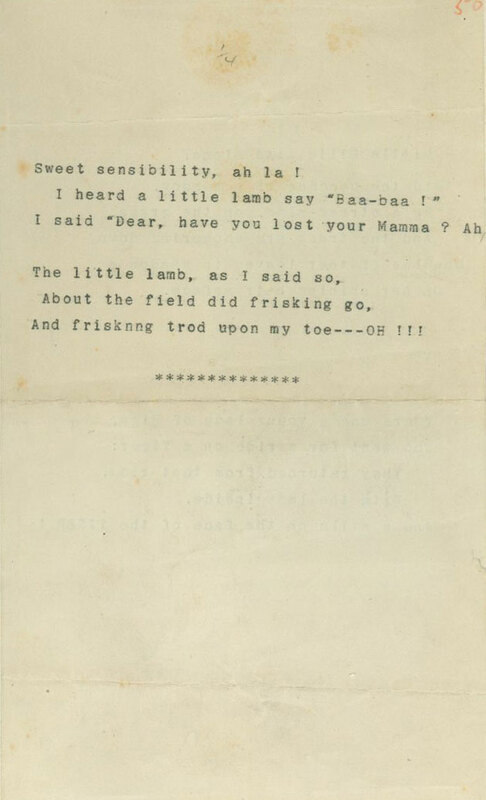 But in the case of MA 6390.3, a small scrap of paper that forms part of the Morgan’s large Lewis Carroll collection, matters were not so clear. The paper contains three poems or extracts from poems, none of them written by Carroll (the pen name of Charles Lutwidge Dodgson). It is not dated, and it was owned by Enid Stevens, who was, as she described herself, Carroll’s “last child-friend.” In addition, it appears to have been typed. MA 6390.3 therefore raised a number of questions: since its provenance seemed to indicate that it was made by Lewis Carroll, when and how had he had access to a typewriter? And why might he have typed up these particular poems, which are an odd assortment, consisting of the first verse of Elizabeth Barrett Browning’s poem “The Romance of the Swan’s Nest,” the well-known limerick about a lady of Riga who goes for a ride on a tiger, and a set of silly verses from the satirical novel The Heroine about a little lamb who steps on the speaker’s toe? Looking into the subject further, I discovered that not only had Carroll used a typewriter, but he had actually owned an early model, the Hammond Number One, invented by James B. Hammond in the United States in the early 1880s. And, remarkably, Carroll’s typewriter had survived. In fact, it had been purchased at auction as recently as 2012 by the collector Charles Lovett. An email to Lovett yielded more valuable information: Carroll, who loved gadgets and inventions, and was an early adopter of many technologies, including photography, bought a Hammond Type-Writer in the spring of 1888. He appears to have used it only intermittently, for business correspondence and the occasional letter to over-eager autograph hunters, but also, significantly, to entertain children when they came to visit him, by typing things up for them and teaching them to use it as well. I suspect that MA 6390.3 was made on one of these occasions, with Carroll choosing passages he thought might appeal to or amuse Enid Stevens: a little Barrett Browning, some badly-behaved lambs. 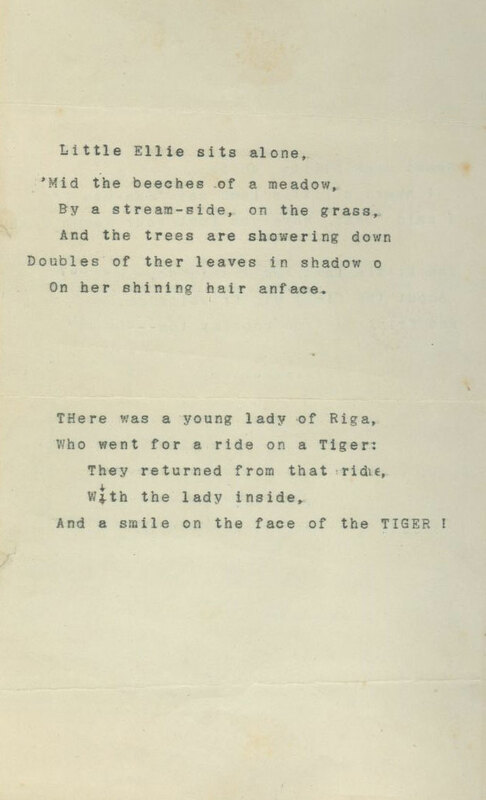 Stevens must have been proud of her official-looking poems, with their neat margins and just a couple of mistakes (was she also helping with the typing?). Carroll’s typewriter is still an impressive object, all gleaming wood and enigmatic levers. Lovett has written an excellent post, including pictures, about the typewriter here. Sal Robinson is a Levy Project Cataloger in the Literary and Historical Manuscripts department, conducting research on a large collection of British letters from the sixteenth to the twentieth centuries. She has also worked as an editor for international literature at Houghton Mifflin Harcourt and Melville House. The Leon Levy Foundation is generously underwriting a major project to upgrade catalog records for the Morgan's collection of literary and historical manuscripts. The project is the most substantive effort to date to improve primary- research information on a portion of this large and highly important collection.